The Asteroid belt, the planet Mars and our moon are presently separate discrete objects in the solar system, but this may not have always been the case. According to the testimony of Corey Goode, bolstered by other insider accounts provided by David Wilcock, there once existed a super-Earth-sized planet where the Asteroid belt is now. Using a highly advanced computer program called Brilliant Pebbles, secret space program scientists were able to develop computer models capable of showing glimpses into solar system history. Approximately 500,000 years ago, according to the findings, a massive super-Earth-sized planet was destroyed, repositioning Mars to its present orbital location. Dr. Thomas Van Flandern is a scientist and researcher that plotted the orbital tracks of objects in the solar system, as well as analyzing the surfaces of Mars, Phobos, and other celestial bodies. He found that a great number of the comets circulating the inner solar system could come from the oceans of this super-Earth. 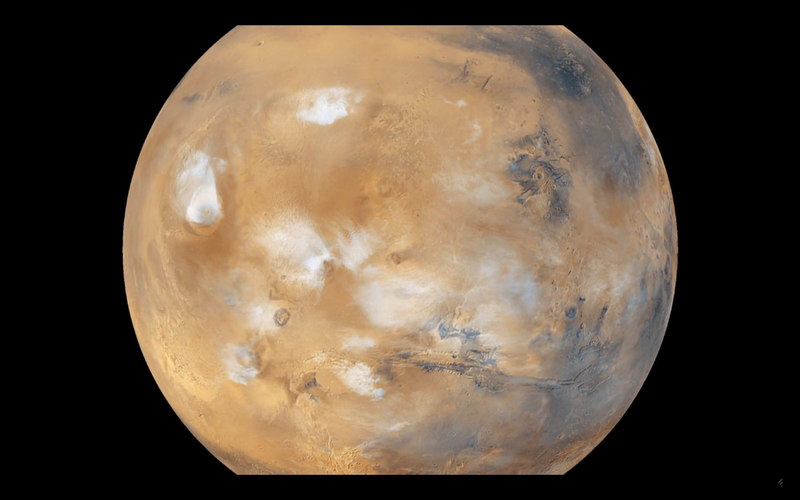 He also demonstrates that Mars was once ravaged by a huge explosive force in the distant past. Goode and Wilcock also discuss the partial disclosure narrative and compartmentalization of the lower level secret space programs. Wilcock features a great deal of information he received from a lower level insider given the name Bruce. They discuss how Bruce's data matches up almost perfectly with the partial disclosure narrative currently being pushed to the public. There are many ancient ruins left on moons, planets and asteroids, but not all of them are from the Ancient Builder Race. Goode says that in some cases there are ruins from other civilizations that evolved in the solar systems deep past mixed in with Ancient Builder Race ruins. The cultures on the super-Earth and its moon, now the planet Mars, were highly technological and aggressive. Apparently one of these groups in the deep past constructed a ring weapon around the planet Saturn. Before they were able to use the weapon, their enemies entered the solar system, destroyed the ring, and caused the destruction of the super-Earth. The beings who once dwelt on these worlds were transferred to the Earth over the course of several refugee relocations by other extraterrestrial races. Apparently this is when our moon was "moved" into position, as part of a refugee relocation effort. David Wilcock covers this relocation extensively in his series Wisdom Teachings, which Shem, from Discerning The Mystery, produces summaries and analyzes of. Goode also takes some time to explain how the information contained on the smart glass pads was produced. 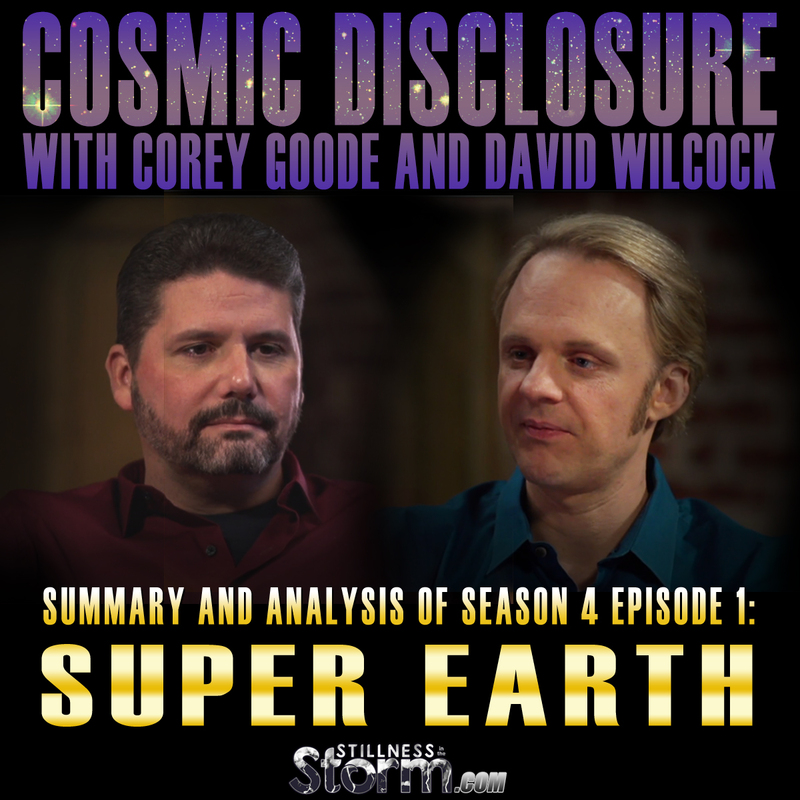 For previous Cosmic Disclosure summaries with David Wilcock and Corey Goode click here. Episodes 1, 2, 4, 5 and 6 have yet to be analyzed, but a transcript of these episodes can be found here. Corey Goode elaborates upon what he learned about the life and demise of Maldek and Mars. What we now know as the asteroid belt was once a super-earth planet with a thriving advanced civilization. Conflict and war led to the destruction of this once great world and its refugees fled to the last remaining vestige of life in the solar system, Earth. 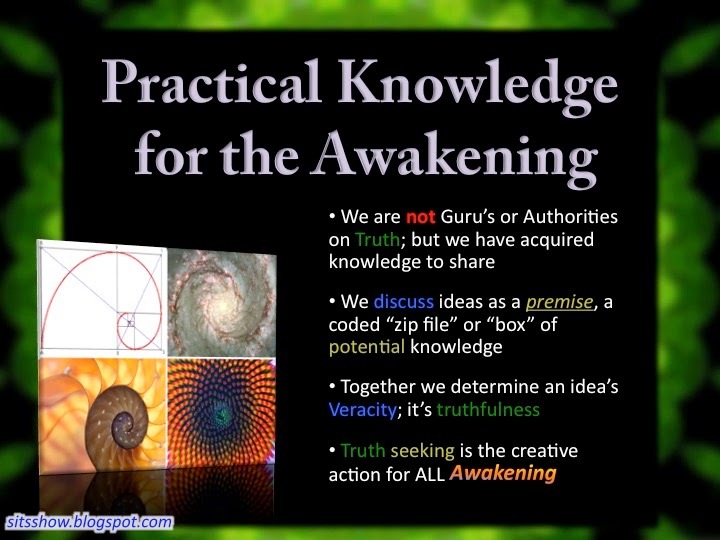 What was once only uttered in the Law of One circles is now being revealed to the public through the slow drip of partial disclosure. This interview with David Wilcock was originally webcast March 8, 2016. Transcribed by Hugues. Commentary by Justin Deschamps. DW - Alright, welcome back to Cosmic Disclosure. I’m your host, David Wilcock and I’m here with Corey Goode. In this episode, we’re going to start exploring some of the cosmic history of our solar system. So Corey, welcome to the show. DW - So, I had heard about this super-Earth well before you ever had anything to say about it. It is mentioned in The Law of One as the planet Maldek. Way back when I first got into all this stuff, Richard C. Hoagland, and all the years I spent studying his material from 1993, when I read Monuments of Mars, he was very big on the idea that the asteroid belt was not something that would normally appear in a solar system. DW - And Hoagland’s top insider told me about something called “Brilliant Pebbles.” When you and I started talking, there was audible shock from you on Skype when I mentioned Brilliant Pebbles to you. DW - And why was that? CG - Because I had heard of that program. DW - So could you… I can kick in some of what I heard about it but this [show] is mostly about getting you to talk. So what did you hear about Brilliant Pebbles? CG - A computer and mathematical program that was rebuilding from what they’ve studied of orbits in the asteroid belt to calculate back the size and density of what it used to be. DW - What [did] it used to be? CG - The asteroid belt? DW - What was the conclusion of this program? 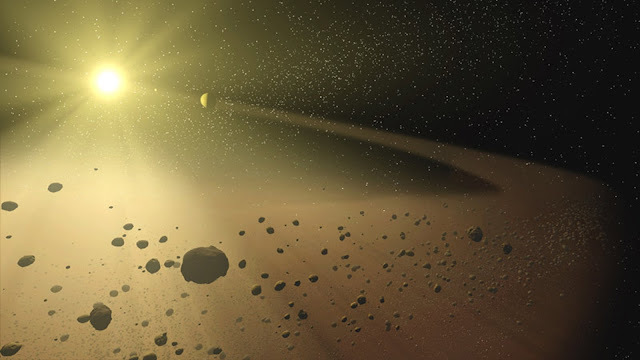 CG - That [the Asteroid belt] was a planet at one time. DW - Okay. Now, I got this information from Hoagland’s top insider, who I refer as Bruce. It’s not his real name. One of the things he said was that they were releasing rocks in space and then charting how they moved and using that to build very advanced computer models of how this would work. DW - I think you’ve mentioned this before on the show but it’s good to repeat it right now: they were able to find different aspects of a planet in the asteroids? DW - So like the mantle, the core, the crust? <Corey nodding yes> These different things — they were able to see different parts? CG - Right. And [they were able to] find different parts of the crust that had different mineral deposits that were even easier to get to than mineral deposits here on Earth. DW - When they went out and looked at these asteroids, they weren’t just fresh asteroids, right? They had been, in some cases, mined thoroughly? DW - And there was a lot of ancient stuff on them? DW - This is very complex scientific data which doesn’t just include the asteroids. It also includes orbital perturbations in the solar system. And it includes all the comets. So he was of the belief that the comets were the pieces of ocean from the planet that froze and turned into ice — water ice. And Van Flandern traced back all these comets and showed that they all actually — you dial it back, they all come to a single point of origin. Like that was [what happened to] the oceans [of the super-Earth, they became comets]. So did you hear anything like that about the comets in Brilliant Pebbles? CG - There was ice in a certain region that came from the failed planet. DW - Hmm… So that would’ve been the oceans that freeze-dried in space? CG - Right. The water from the planet. DW - So from this military perspective, they created a narrative about ancient extraterrestrials that came and went, [but] are not here now. They had this whole [false] storyline built around it. [Bruce] didn’t use the term, “Ancient Builder Race” that I remember. That was something I heard from you. CG - I was wondering if [Bruce] was talking about the same [storyline]. DW - But he did basically give me the same information. Now this was a weird thing because when I first started talking to you, I had taken his testimony at face value, as being accurate. And what he was told, for whatever level of compartmentalization he was in, was that this Ancient Builder Race —and we’ll just use that term even though he didn’t — the Ancient Builder Race was five million years [old], that all this stuff happened. But your data on the Ancient Builder Race is actually much older than that. DW - What was the actual data that you were given, for when these Ancient Builder Race artifacts appeared? CG - They were many tens of millions of years old, further back [or much older] than any other type or signs of civilization, [even with] the newer ET groups that moved in [after the super-Earth's destruction]. Way [older]. DW - Did [the people in the SSP who did these studies] have any ability to try to get a specific time [frame]? Or was it just that it was countless millions of years old? CG - There’s so very little that [is] known about [the Ancient Builder Race]. When [the SSP explorers] would find [Ancient Builder Race] structures, every time they would find the structures that were [the most] exposed [or accessible]. There were [structures] that obviously had glyphs on them, but had been wiped clean by other races that had come [after]. So there was a lot of mythology among all the different [SSP] groups that were [trying to link it to their] mythology. But when it came down to brass tacks, very little [is] known about [the origin and culture of the Ancient Builder Race]. A lot of mystery. DW - Does that technology work if you go back many millions of years? Or does it start to become a lot less accurate. CG - Yeah, it works. It starts to become less accurate and you get wider time frames. CG - This is how partial disclosure is going to work. [The secret-Earth government, their syndicates and their Earth-based alliance allies are] going to tell people there’s a thin atmosphere on Pluto, that it has blue skies. DW - I just saw that last night, yeah… and water. CG - There’s liquid water on different planets. 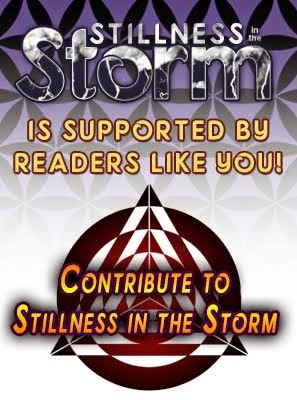 And then they're going to finally get to a point to where they get to do their narrative of disclosure, [the] slow, partial disclosure narrative. And then they’re going to try that narrative to talk about this ancient ET race that used to be here that disappeared, [which is] very ancient. And that will be probably the first bit of information people will get. DW - What kind of an effect are they thinking will happen if they say that there was an Ancient Builder Race? DW - So polls [conducted by certain outlets about belief in aliens] are showing that even in the most traditional parts of America, the parts that wouldn’t be open to new information, we’re looking at fifty-five percent (55%) rate of acceptance [about] the existence of extraterrestrial life. So the old idea that, oh, "War of the Worlds, it’s all going to come crashing down." People will go into a panic. It’s not going to happen if they tried to push out this narrative that some weird and interesting ancient race was here a long time ago. CG - Right. That’s what [the lower level SSP groups] believe. DW - Is this super-Earth, do you think, going to be a major part of that first wave [of partial disclosure], talking about what the asteroid belt actually [is]? CG - Yes. We’ll probably hear some version of the history of our solar system that they “learned” <quote gesture>. DW - The idea that Hoagland put forward also included the notion that Mars was a watery planet that was actually a captured moon around this super-Earth, that both of them had oceans. And that this explosion that created the asteroids [also] smashed into the side of Mars and caused excessive damage. Was that consistent with what you heard from the smart glass pads, or however it was that you came in contact with this information? 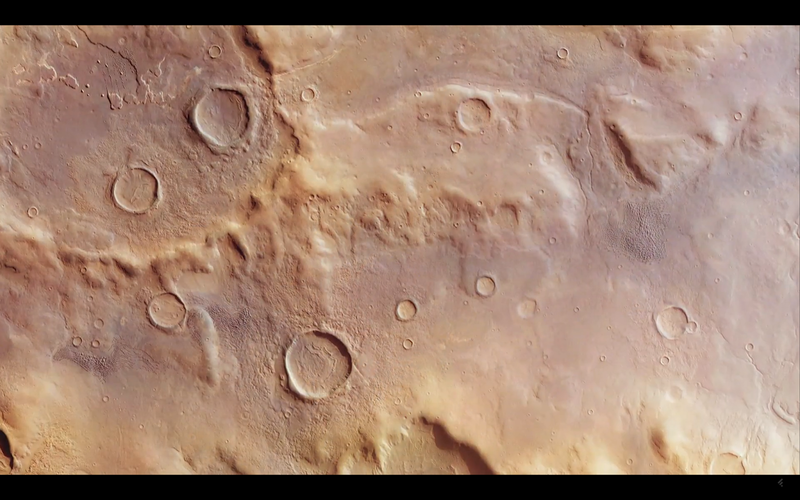 Image of Mars showing scars that could be from an ancient explosion. Another image of Mars surface showing possible pre-existing landscape features. CG - Yes, it was. It was postulated that Mars was most likely a moon of that super-Earth. And that it was damaged heavily on one side by massive impacts [which] most likely also stripped away its main atmosphere at the time, and it never recovered. CG - Yeah, never fully recovered [from] what it was before. CG - No. They’re not the Ancient Builder Race. CG - And it seems that more recent information that I’ve gotten [from the inner-Earth peoples] is telling us that the Earth received refugees at different points in history, from a couple of different planets at least in our solar system. [In each case,] the planets failed, [the] inhabitants left and came to Earth as refugees. DW - And that would be Mars and the super-Earth? DW - And again, that’s completely consistent with what the Law of One actually says. They described the super-Earth. They call it Maldek and they say that it blew up. I believe [that] the figure they give was 800 thousand years ago. So it’s not exactly the same as the data that Brilliant Pebbles calculated. Because when I spoke to this guy, Bruce, they were saving it as about 500 thousand years ago. So is that what you saw in the Brilliant Pebbles data as well? DW - Okay. So another thing that was a big part of what Bruce shared with me, was that the people [of] the super-Earth were starting to build a ring around Saturn that was made of some sort of transparent aluminum alloy. If the ring had [been] completed, they would have [had] a pulse weapon that they could use to destroy other worlds. [This device sounds very similar to the Halo Array weapon described in the hugely popular video game series, Halo.] He said that this weapon was attacked and destroyed at the same time the super-Earth was destroyed and that the shattered remnants of it formed the rings of Saturn. [Bruce added that] they would go out and study these pieces of habitable — there were [remnants of] rooms people could [have lived] in, inside this shattered ring that you could still go out and look at. Did you encounter any of that information? CG - I encountered information about the rings being full of artifacts, similar to that but I had not heard the information about it being a giant weapon. DW - What was the specific data that you got about that? CG - That [the rings] had the transparent alloy in [them]. CG - Yeah, but it had debris that looked like it was part of structures. DW - Wow. Broken structures? DW - Okay. Now I also want to point out, Bruce said on the edge of the B-ring were the biggest chunks of the ring [weapon] and that’s where it originally was. 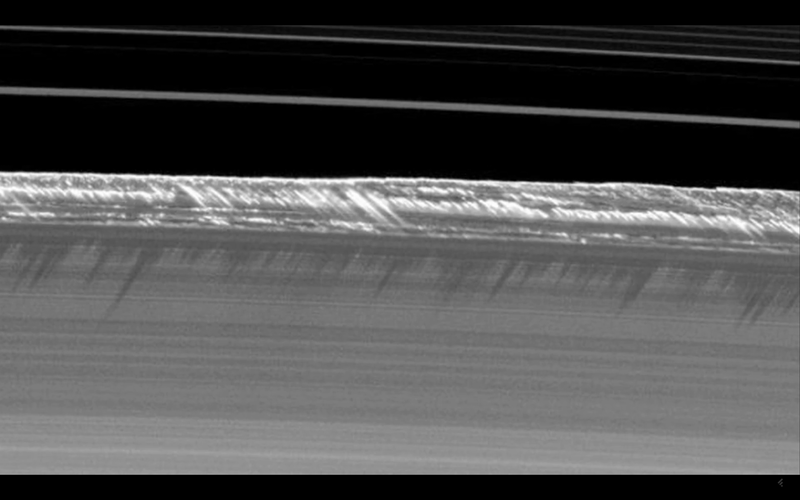 So let’s take a look right now at a couple of images of these alleged ice crystals on the B-ring. 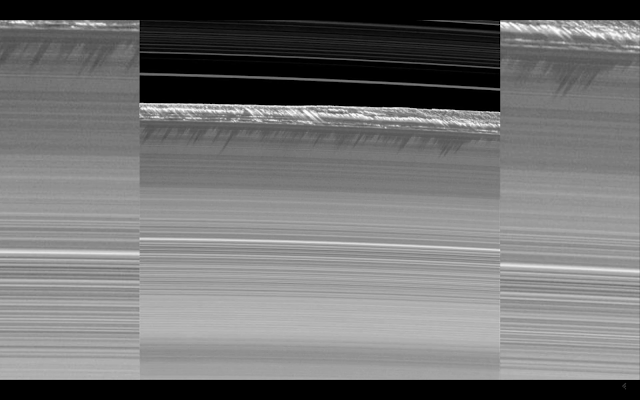 B-ring of Saturn, with "ice crystals" on outer edge. DW - So if you’re looking at this image, what you’re seeing now is the shadows that are cast [by these structures]. As we zoom in on that, you see there are actually some pretty big chunks there. 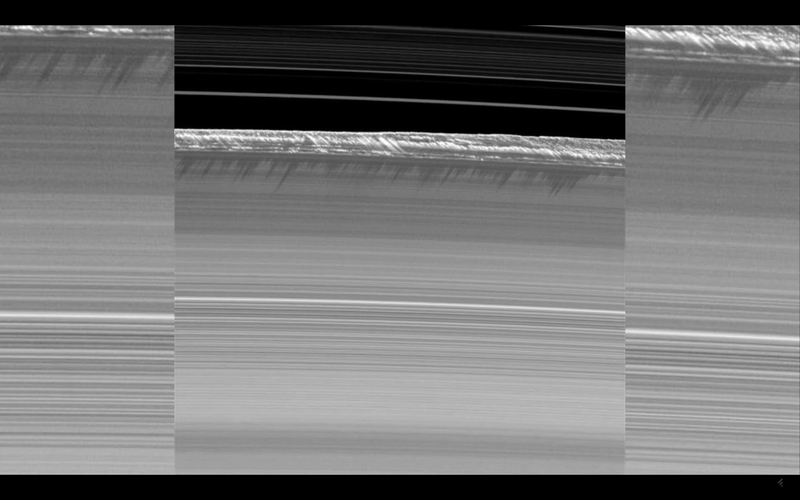 Those shadows [are] actually cast on the rings. So what we heard from Bruce is that those alleged “ice crystals” <quote gesture> are actually large pieces of rooms that people could [have] lived in [at one time]. But these are people of an extreme height. Now this is an area where our data correlated. Bruce told me that these rooms where built for people who [were probably] 70 feet tall. Now did you hear about there being ruins that were built for people of that type of size and stature? DW - Okay. So there’s a lot of crossover [between Ancient Builder Race and other civilizations' ruins]. CG - Yeah, there’s [some] crossover. They have found [stone slabs] of the Ancient Builder Race, that are obviously not sarcophagus, but that people [laid] on for healing. When the humans would lay on them, [the slabs] were a lot bigger than what was needed for a human to lay on. DW - Did they still work for healing? DW - Really? Wow. The ring [weapon] you never heard about but you did hear about the shattered remains of something that was there? DW - Okay. So to continue with Bruce’s story then, he said that whoever was on the super-Earth had been a very warlike species. They had gone out and really pissed off some people in other star systems. Did you hear that the people on the super-Earth had a technology that would allow them to have left the solar system and made war on other planets in other solar systems? CG - There’s really not that much known, I mean, fully known [about these ruins] but there are a lot people trying to tie themselves to bloodlines from these planets. Or [they try to] tie their mythology to these narratives, somehow. So I just basically saw a lot of the scientific data and information. [I] was not exposed to a whole lot of the theoretical [information]. DW - Well, let’s just extrapolate off what you do know. Clearly, the people on the super-Earth had technology vastly in excess of what we have now. DW - Clearly, they had the ability to travel to another planet in the solar system, Saturn, and build this massive, massive, massive structure. I mean, the size of Saturn! <Emphatically> To actually build a ring that’s going to go two thirds (⅔) of the way around [the planet], it is almost an unthinkable architectural achievement. CG - The people in the Inner Earth Council stated that the different inhabitants of the planets in our solar system were extremely advanced technologically, [were] extremely aggressive, that they destroyed their civilizations and had to be relocated here as refugees by other ET races that came in. DW - And again, that’s remarkably, precisely what The Law of One says, which you hadn’t read when this happened to you. CG - Still haven’t <smiling>. DW - <Laughing> So did this civilization that was on the super-Earth also settle Mars at the same time, if it had oceans and water? CG - The freshest information that I have is that two different groups independently arose on different planets, [the super-Earth and Mars,] even though one may be considered a moon. DW - My personal speculation, based on trying to connect the dots and the Law of One, has been that Mars was heavily damaged by the explosion but it wasn’t completely damaged past the point where some type of life couldn’t cling to it, even if maybe it involved a lot of underground bases that might have already been built before [the destruction] happened. DW - Do you think that’s possible? CG - Right, right… But the surface, the previous ecosystem, was gone. DW - Right, but they could have had a vast underground infrastructure in place [that remained after the event]. CG - Right. [If] they were both advanced civilizations. Then yeah, that would make sense. DW - Okay. So then the next thing was — and this is going to start to segue into what we’re going to keep talking about in the next episode — the Moon. Instead of me blabbing my big mouth, let’s keep it simple and have you tell us. Where did the Moon come from? What the heck is going on with the Moon, our Earth’s moon? CG - Okay. According to the smart glass pads and what was reported, is that – and this is very controversial – that the moon arrived right around that also 500,000 year time period. CG - It arrived and formed some sort of tidal lock with the core of the Earth. DW - Oh, it arrived to the Earth. CG - To the Earth… and into an orbit that changes very little over time. And it came here from the explosion from the super-Earth. DW - It came here? DW - So it drifted over from the… as the super-Earth [got] blasted, that [satellite, our moon,] drifted and somehow got gravitationally captured by the Earth? CG - Some of the information was that it was under intelligent control: that it was artificial and that it was bringing refugees here. DW - Some of the information? So not all of the information said the same thing? CG - Right. There [are] always opposing [views]. Every time you had information [in smart glass pads or presented elsewhere], you had peer review type information, opposing views, why this could also mean [that, etc]. [This type of format] was always present. But you always had to read the bottom [Transcriber, HP's Note: hyperlinked footnotes probably] and also, see that there were other views, even though [the main article] was accepted by most of the peers. DW - Who were the peers? DW - Which faction are we talking about? ICC [Interstellar Corporate Conglomerate]? CG - Well, that would be most likely a joint [researcher project because] they all speak the same language. You know, [they] agree on the same kind of stuff. I don’t know what standard it was but they had a peer review process. It wasn’t just — one scientist couldn’t just do an experiment, come to a conclusion and then put it in the database as fact. <Slight laugh> It had to go through a [verification or vetting] process as well. DW - And I think it’s interesting for people to understand that [these SSP sources] don’t have all the answers. They’re doing research and they’re trying to connect the dots with an archeological expedition, the same way that we would find an ancient city, dig it out, and then have to study the pots, study the writing, and see if we can decipher the [text], and all this kind of stuff. CG - Right, and [these research scientists I am talking about] tried to stay away from a lot of the mythology [of] the different groups. There are different groups that have a lot of different ideas about who all the different people were. There are different narratives from different groups. DW - Different extraterrestrial groups, you’re saying? CG - The people that came from these planets that were destroyed, or lost their viability. That brought the refugees here to the surface of our planet. There are different groups, different descriptions of who these [beings were]: different narratives that fit [certain] belief systems. DW - Right. So there is no absolute standard of what actually happened that anybody can agree on at this point? DW - Well, that’s frustrating but I guess that’s the result. If different people are saying different things, they can’t all be right. It’s just like with religion. DW - This means that these [different narratives] are probably like religions, right? DW - They are religious beliefs in a sense. CG - Well there are all of these different Earth government syndicates. [They each] have different occultic [sic: occult] roots and they try to tie everything to their root occult beliefs. CG - Under our backyard <both laughing>. DW - Some of them have been around for, as you were told, seventeen to nineteen (17–19) million years. CG - <Correcting:> Seventeen to eighteen (17–18) million. DW - Seventeen to eighteen: that’s a long time. DW - That would mean that whatever happened to this super-Earth was long <strong emphasis> after they were here to witness whatever was taking place. DW - Why were they so unhappy about that? CG - Because this race was very aggressive and immediately began to assert itself on this planet and interbreed with the surface humans that were naturally from this planet: interbreed with each [of] the other groups. And all ended up mixing together into a largely mixed race. They consider us [this] mixed human race on the surface. DW - And that aggressiveness is what makes us, to [the inner-Earth groups), very dangerous? CG - Yes, very unpredictable, dangerous. DW - One of the other things that Bruce said that I want to run by you is [the following]. 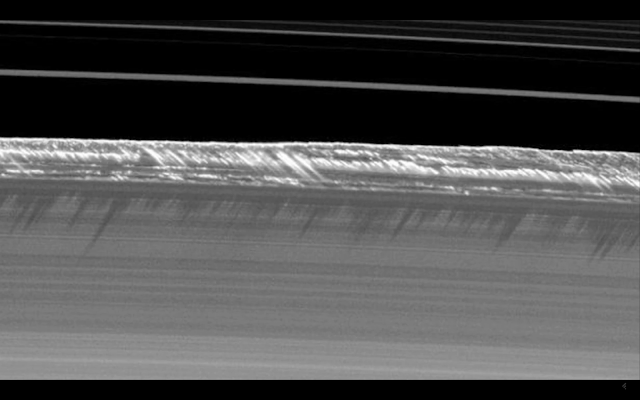 People are going to be saying — and we’re going to get back to talking about refugees – "but how did this ring built around Saturn become a weapon?" So I just want to explain what [Bruce] said, what their intel told them. So what he said was that the ring was designed to send pulses into Saturn and those pulses would reflect back out to the ring and then back into the planet. It would build up this incredible charge and then the ring could actually direct the beam at any location in three-dimensional space that it wanted to go. They could triangulate the beam to basically any location. Now, this sounds an awful lot like a movie that we all know and love, doesn’t it? CG - Right. There are a lot of different little caveats in Star Wars. 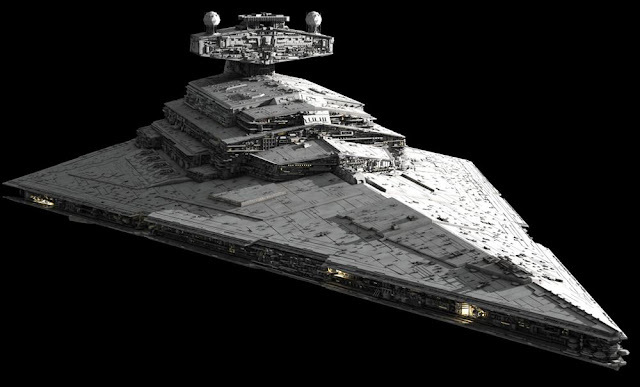 Some of the ships from the Empire look very similar to the Dark Fleet vessels. Star Destroyer from the film Star Wars. DW - So in the next episode – [and] these two definitely go together – we’re going to get into what exactly happened with the Moon and really delve into that story. That’s coming up next time here on Cosmic Disclosure. I’m your host, David Wilcock, and I thank you for watching. Click here for a Summary and Analysis of Season 4 Episode 2.